THIS IS A BLOG FOR LINUX USERS WHO WANT TO KNOW MORE ABOUT THEIR FAVOURITE OS. MOST INTERESTING NEWS FROM THE LINUX COMMUNITY, USEFUL ADMINISTRATION TIPS & TRICKS, WEIRD AND FUNNY FACTS YOU PROBABLY HAVEN'T EVER HEARD ABOUT! On my production machines I'm running Debian Etch, because I prefer the stable Debian tree. It runs great, but there is just one problem: the 2.6.18 kernel is a bit outdated nowdays since it does not support all the latest hardware, like newest motherboards based on Intel P35 chipset. ASUS P5K series is a good example. The problem with this board is that 2.6.18 kernel which comes with Debian Etch by default does not support both SATA controller and NIC of ICH9. Of course, I can always download & compile the latest 2.6.23.1 sources and install it on my Debian Etch box. But there is a better solution now, thanks to Kenshi Muto who has created and supports the archive of backported Debian-installer images. The latest addition is Debian Etch with 2.6.23.1 kernel and experimental e1000e driver. I've successfully installed it on my machine with ASUS P5KR motherboard and it runs great! Both ICH9 SATA controller and Attansic L1 NIC work well. Some times ago I wrote about how to improve look&feel of web form widgets in Firefox which are rather ugly by default. There is another way to do this which works in Ubuntu. First of all, you need to download bzipped tarball (you must be registered at ubuntuforums.org to do this). At the moment of writing 2.7 is the latest package version. Then you have two options: either use graphical installer or run a text-based one (which is an ordinary bash script). Note, that you must specify correct Firefox directory! The default /usr/lib/firefox is fine for Ubuntu unless you are using Swiftfox or have very non-standard configuration. If you've chosen to install widgets by the means of text-based script, you may specify the path via -p or --path option (type ./installer --help for details). The results are pretty much the same, as I have already described. I should also mention that there is a backup forms.css file in the archive in case you mess anything up. This file is from a default 64-bit Firefox 2.0 installation. The forms.css file an be found in Firefox's "res" directory. You won't need it unless you accidently delete your's or the script malfunctions. I have not tested it yet, so use at your own risk! See this topic for more infomation. 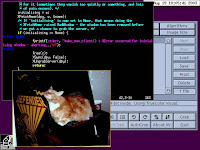 Revolution OS is a 2001 documentary which traces the history of GNU, Linux, and the open source and free software movements. This is the story of people who rebelled against the proprietary software model and Microsoft to create GNU/Linux and the Open Source movement. It features several interviews with well-known hackers and entrepreneurs, including Linus Torvalds, Richard Stallman and many others. On June 1, 2001, Microsoft CEO Steve Ballmer said "Linux is a cancer that attaches itself in an intellectual property sense to everything it touches." Microsoft fears GNU/Linux, and rightly so. GNU/Linux and the Open Source & Free Software movements arguably represent the greatest threat to Microsoft's way of life. 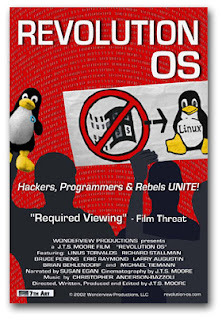 Shot in cinemascope on 35mm film in Silicon Valley, Revolution OS tracks down the key movers and shakers behind Linux, and finds out how and why Linux became such a potent threat. Linus Torvalds is interviewed on his development of the Linux kernel as well as on the GNU/Linux naming controversy and Linux's further evolution, including its commercialization. Richard Stallman remarks on some of the ideological aspects of open source vis-á-vis Communism and capitalism and well as on several aspects of the development of GNU/Linux. REVOLUTION OS is available in the 35 mm motion picture format and runs 85 minutes. Now it is also shipping on DVD. Designed to be primarily used from the keyboard, Ion was written as an experiment on a different kind of window management model. It tries to address the navigation problem by dividing the screen into mutually non-overlapping frames that take up the whole screen. Big displays have so much space that this should be convenient and smaller displays couldn't show more than one window at a time anyway. The frame layout is, of course, dynamic and different on each workspace. Given the organised tree based instead of an unorganised coordinate-based frame layout, moving between the frames can be conveniently done from the keyboard. As in PWM, the frames may have multiple clients attached, each indicated with a tab. 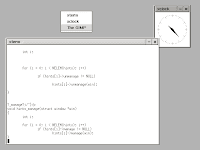 Sawfish is an extensible window manager using a Lisp-based scripting language --all window decorations are configurable and all user-interface policy is controlled through the extension language. Despite this extensibility its policy is very minimal compared to most window managers. Its aim is simply to manage windows in the most flexible and attractive manner possible. As such it does not implement desktop backgrounds, applications docks, or other things that may be achieved through separate applications. 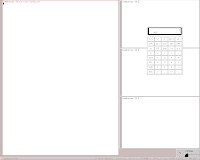 dwm is a fast and simple window manager for X11. It manages windows in tiling and floating modes. Either mode can be applied dynamically, optimizing the environment for the application in use and the task performed. Windows can be tagged with one or multiple tags. Selecting certain tags displays all windows that are accordingly tagged. awesome is a tiling window manager initialy based on a dwm code rewriting. It's extremely fast, small, dynamic and awesome. 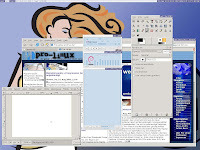 Windows can be managed in several layouts: tiled and floating. Each layout can be applied on the fly, optimizing the environment for the application in use and the task performed. Managing windows in tiled mode assures that no space will be waste on your screen. No gaps, no overlap. With tiled layout, windows are managed in a master and a stacking area. The master area contains the windows which currently need most attention, whereas the stacking area contains all other windows. The master area can be splited in several rows and column, as you want. In floating layout, windows can be resized and moved freely, just like a usual window manager. Dialog windows are always managed floating, regardless of the layout selected. Windows are grouped by tags. Each window can be tagged with one or multiple tags. Selecting certain tags displays all windows with those tags. Each tag can have its own layout. Tags can be compared to virtual desktops, but it's more powerful: you can quickly merge and show several tags at the same time, and go back to only one tag after. Karmen is an easy-to-use window manager for X, written by Johan Veenhuizen. It is designed to “just work”. There is no configuration file and no library dependencies other than Xlib. The input focus model is click-to-focus. Karmen aims at ICCCM and EWMH compliance. 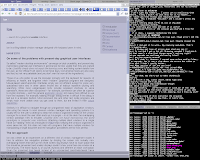 The current version is Karmen 0.13, released September 4, 2007.
evilwm is a minimalist window manager for the X Window System. 'Minimalist' here doesn't mean it's too bare to be usable - it just means it omits a lot of the stuff that make other window managers unusable. It has no icons and no window decorations apart from a simple 1 pixel border. Provides good keyboard control, including repositioning and maximise toggles, snap-to-border support and virtual desktops. evilwm has extremely small binary size (even with everything turned on). 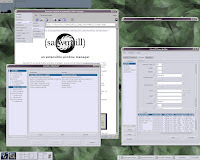 larswm is a rewrite of 9wm that adds automatic tiling, virtual desktops and many more features to make it a highly productive user environment. Despite the high level of automation, it uses very little CPU time and memory while running. 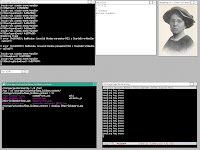 Anarchy is a window manager for the X Window System and is implemented in less than 500 lines of CLOS oriented Scheme code.Despite its small code size, it supports most functions expected of a basic window manager (move, resize, hide, minimize, maximize, list windows, root menu). If you are an expirienced Java programmer, you probably want to have the latest JDK on your Debian box. Normally there is no need to install it manually since JDK (as well as JRE) is available in modern distros as .deb package and therefore may be downloaded and installed from one of the official mirrors using familiar apt-get (or aptitude, or Synaptics, or whatever...) interface. 1. Download self-extracting package containing JDK: jdk-6u3-linux-i586.bin. 3. Run it, answer yes and watch the files being extracted. Debian is considered by its die hard followers (like myself ;) to be one of the few GNU/Linux distributions which can stand up to other Linux OSes with regard to security without sacrificing those aspects which make GNU/Linux the most feature-rich POSIX OS in the world. But once you finish installing Debian, you need to do some tricks in order to be able to play multimedia files which are encoded using proprietary or closed formats such as Microsoft WMV or Apple QuickTime.